When making financial plans, average investment returns can be useful in calculating the future value of my investments. But the results can also be misleading, potentially leaving me with a shortfall during my retirement or spending years. For general planning purposes, using an annual return based on historical averages can help me determine how much money I should set aside and invest periodically to reach my goals. Using average returns, I would realize that I need to set aside at least $1,600 each year from now until retirement. Further, if I considered the difference between the long-term returns of the S&P 500 and treasury bills, and the amount I'd need to save to reach financial goals (approximately $1600 in the S&P 500 vs. $8200 in treasury bills), then I may decide to accept the risks associated with stock-market investing. So, the use of average returns can give me a starting point for determining my annual savings rate AND give me insight into how more risk and higher returns over long periods of time are beneficial to attaining my financial goals. Average (arithmetic) returns can be misleading, though, because investment balances don't grow on a linear basis as the math and concept suggest. For starters, an average arithmetic-based return doesn't account accurately for actual growth or decline in investment balances on a yearly basis. Such a return is simply the total of all returns divided by the number of years. For long-term planning purposes, a more meaningful number is the geometric average (or compound) return, which represents the actual rate of return. This approach accounts for the impact of positive and negative years. In his book, How Much Money Do I Need to Retire? , former hedge fund manager and financial mentor Todd Tresidder gives some simple examples of these calculations to illustrate this concept. Let's say I experience investment returns of -20% one year and 20% the following year. If I started with $100, I would have $80 at the end of the first year [100 + (100 x -.20)], and $96 at the end of the second year [80 + (80 x .20)]. Alternatively, if my first year return was 20% and my balance grew to $120 [100 + (100 x .20)], but was followed by -20% returns [120 + (120 x -.20)], I'd also have just $96. The arithmetic average annual return is 0% (-20% + 20% = 0%). Following this formula would mean that I have $100 at the end of two years. But because of the impact of negative returns, my actual balance is $96. The compound (aka geometric average) return is about -2%. During the years I'm saving toward a goal, using average arithmetic returns for planning purposes may cause me not to set aside enough money for investing each year. So, I should consider using a rate that is closer to the compound return for planning purposes. (I'll also mention that historical returns, even over 30-50 years, may not accurately predict future returns; but for now, I'll consider the past as a relevant indicator of the future over the long haul). Calculations (and investment-return projections) become more complex when I'm actually ready to spend money to realize my goals. At this point, when I've stopped adding to my investment balances and am starting to take distributions, I need to be concerned about the sequence of returns. 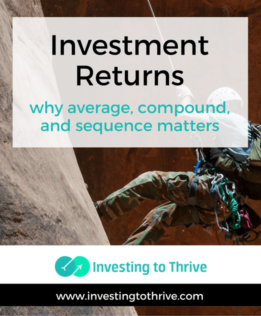 In the second scenario, my average (arithmetic) return over 5 years is 8%; however the sequence of returns results in a spend down of my principal, even though I adjusted my withdrawal rate based on the declining investment balance. So, the sequence of returns matters. And my million-dollar portfolio would have shrunk to $681,000 even if I adjusted my spending. So, a few bad years can derail my retirement plans, particularly if I had been counting on average returns. In Todd Tresidder's books on retirement , he offers deeper insights in regard to anticipating and dealing with these periods of declines. Right now, though, I'll focus on the main idea that investors experience returns as they occur, not as averages. When young and starting to accumulate wealth, I considered compound returns (or geometric average returns) to calculate how much to save for future goals. However, as I approach spending my investment balances, I've learned how the sequence of returns can impact my wealth over the long term and have started to plan accordingly. Start planning for your retirement with How Much Money Do I Need to Retire? I really enjoyed this article. Very infomative!